For the record, the winner of the Fresh 20 cookbook was notified via email. Thanks to everyone who entered!! Now, as for things running, I am on a mission. 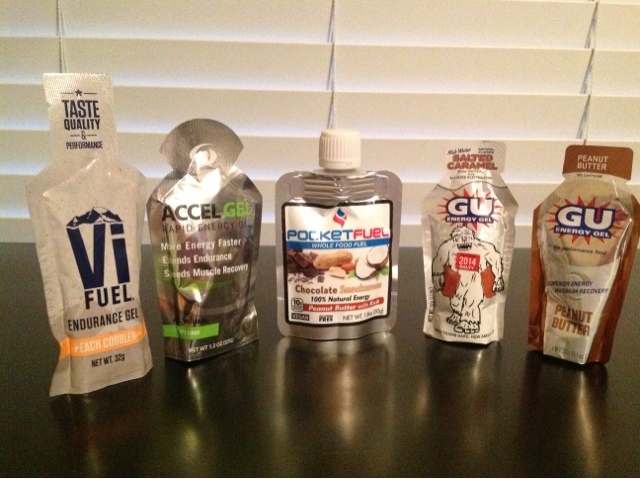 I am trying to find the perfect running fuel. For me. I have tried it all. Gu, chews, waffles, candy, beans...you name it. Everything either bothered my stomach or was too sweet to get down. Literally. I could hardly swallow them. So I gave up. I did all my training runs for my last marathon and ran the race on just water and electrolyte tablets. But I'm starting to wonder if a little fuel, at least toward the end of a marathon, wouldn't be such a bad idea. So I'm on that mission I mentioned earlier. I got five kinds of gels I haven't tried before, hoping to find one that is both kind to my stomach and doesn't make me want to immediately spit it out and wipe off my tongue. So tell me...what do you fuel with on long runs? I'm a fan of GU, but haven't tried Salted Caramel (which sounds heavenly, by the way). I do love the PB GU! Good luck! I like Hammer Gels. They are made with more natural ingredients. Raspberry is my favorite. I also like Cliff chocolate covered cherry and Gu chocolate mint and peanut butter. You can mix them with water and carry them on a belt or in a camelback. I read on fastcory.com about tailwind nutrition (under his gear section), it is calories in drink form and is supposedly easy on the stomach. It might be a good alternative to only water, without using gross gels all the time - I can't handle gels that often, the texture is what gets me. Again I'm an idiot and am just throwing down my 2 cents here. I gag on gels, but love Honey Stinger chews. Will sometimes take GU chews but Honey Stinger is really the only thing I fuel on. I also started taking salt tabs on my long trail runs as I was starting to bonk and knew it wasn't calories so tried salt and voila! Felt better. My son doesn't like any type of gels/chews so eats a power bar on long runs. Good luck finding something! I'm a BIG fan of GU tri-berry, vanilla and mandarin orange.